Rockhound Alert! Comments to BLM Needed Now! BLM is considering opening the Grand Staircase-Escalante National Monument and surrounding areas to casual collecting of rocks, gems, and minerals, as well as non-vertebrae fossils. This vast area in Southern Utah has been closed to collectors since 1996. BLM needs your comments by November 30th. The following .pdf file gives you ways to comment electronically and by post. It also links to other valuable resources. The Southern California Paleontological Society is at the forefront of the comment movement, having drafted an excellent letter supporting the opening of this rugged yet beautiful land. Original letters are strongly urged. I typed up a letter this morning and it is already in the mail. Here’s wishing you get involved, too. Thanks in advance! Hello, my name is Thomas Farley and I am an outdoor writer living in Las Vegas, Nevada. I support a decision to open up the Grand Staircase-Escalante National Monument (GSENM) and the Kanab-Escalante Planning Area to casual rock collecting. As to my comments, I belong to several rock, gem, and mineral clubs, as well as two prospecting clubs. I am currently writing a book on rockhounding for beginners in the Southwestern United States. Adventure Publications is my publisher and the book will be out in early 2020. In my writing for the book I’ve encountered countless rockhounds who are aggrieved with the constantly diminishing amount of public land to collect on. 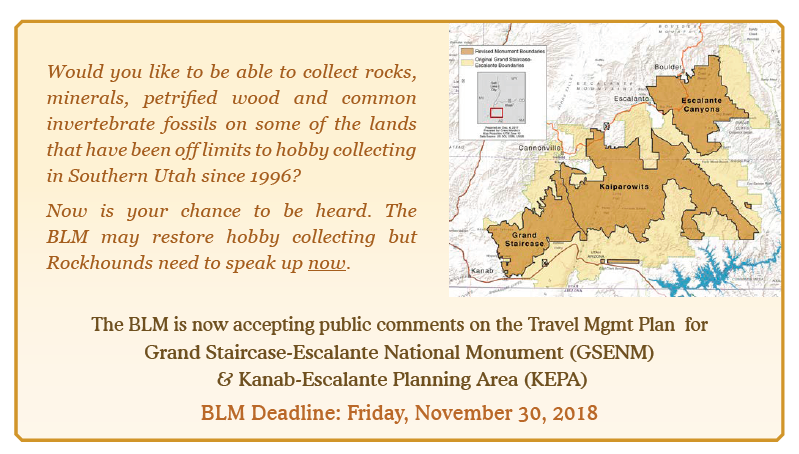 I would urge all planners in this matter to consider allowing casual collecting in the Grand Staircase-Escalante National Monument (GSENM) and the Kanab-Escalante Planning Area (KEPA). These grounds have been closed for too long. Nearby Gold Butte National Monument in Nevada allows casual collecting of rocks and minerals and has suffered no ill effects. As land withdrawn from mineral claims, these kind of areas allow rockhounding without the worry of trespass and as such provide a stress free exploring experience. Rockhounding is an enjoyable solo and family activity. Sadly, the hobby seems to be gentrifying as fewer and fewer young people participate in the hobby. I think these numbers would increase as ground open to collecting increases. As an adjunct to camping or even day trips, rockhounding is a terrific pastime that encourages an appreciation for our public lands. It increases tourism and brings money to rural towns and villages. I strongly advise the committee to allow casual collecting. Next PostNext Label Those Cables!